Since 1204 Watton has been a market town. A long time from 1204 until the middle of the twentieth century, but now the real markets are there no more. We do still have some rows of assorted stalls where you can buy an abundance of greengrocery, or risk encounters with shopping trolleys, but the real markets, the heart of the matter, are gone. The reason of course is that the demand for them has gone also. Until the Second World War a very large number of people owned or hired land, varying from the farmer owner occupier, tenant farmer smallholder down to the chap with an allotment or large garden. All these produced livestock, including poultry, dairy produce, eggs, vegetables, and all types of commodities connected with the countryside. ONE CHANGING FACE OF WATTON! 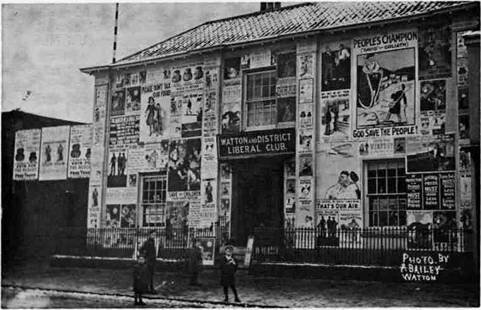 The premises of the Liberal Club are here seen decorated for the 1902 General Election. Since that time part of the building has been used for residential purposes, and the remainder has, in turn housed Horace Siggins' butchers shop. The Ashill Meat Company, Codling's boot and shoe repair and retail business. The building is now demolished and King's Chemist shop stands on part of the site. The market provided a place for the seller to sell and buyer to buy, with a fair price established by the fall of the auctioneer's hammer. At H. G. Barnham's sale yard, on the site now occupied by Noel Abel's furniture saleroom, the Wednesday morning scene was one of unending bustle. Horse-drawn carts and. a few years later. Fordson tractors with trailers and little motor lorries were unloading into numbered pens pigs, sheep, cattle, and every now and then a day-old calf or a goat or two. Hundreds of crated chickens arrived in transport ranging from handcarts to bindertwined cycle carriers, and were deftly placed in the long rows of wire netting pens. might say adding chaos to confusion. Big bluff noisy friendly old Walter is no longer with us. so it is as well perhaps that the saleyard is closed, because one would not seem right without the other.